It’s almost been a year since we featured the CB750F Bobber created by Chris Tragert from Venice Choppers. 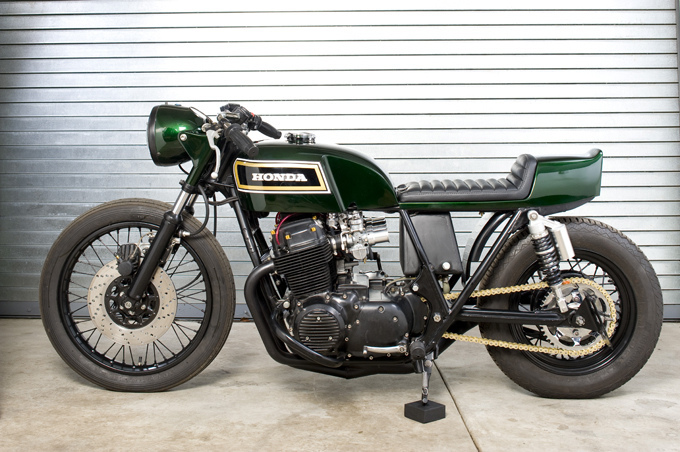 Chris has again choosen to use the CB750F as the donor bike, but this time creating a mean looking CB750F café racer. “A ‘proper’ café racer is fine for nipping down to the pub for a pint, but the streets of L.A. are no tea party” says Chris. “The starting point was a 78 CB750F, chosen for it’s potent black lump. The Comstar wheels, and bodywork, however, stood in the way of the desired ‘rocker’ look, so a little reverse engineering was in order. Stripped bare, and shaved, the frame is fitted with forks, swingarm, wheels, and pegs from a 69 CB750. The rear subframe was modified to hold the battery and electrical components, which are concealed beneath a custom fitted tailpiece. Knee cut-outs on the 69 tank flow into the tuck and roll seat, to create a narrow cockpit. The lowered stance comes from cut down forks in front, with 11″ shocks, and a 135/15 radial in the rear. 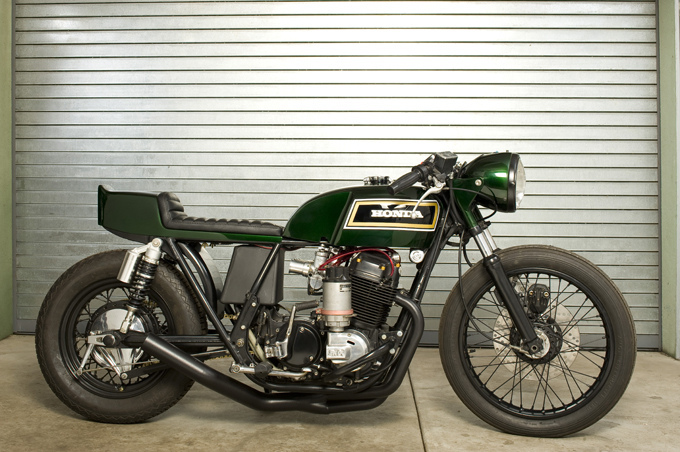 The engines racer intentions are broadcast through a repro Yoshimura pipe, fueled by round-top carbs with machined stacks, and ignited by a Russ Collins bevel drive spinning a Vertex magneto. Rounding out the package are a high capacity oil tank, and headlight bucket with integrated speedo”. The oil tank and headlight are from BCR and that distinctive tailpiece and pipes are clearly from Carpy. Overall the bike is a well balanced mix of classic and street – the only thing missing are the clip-ons.